Tis the season to bake. And to bring it to work so I don’t end up eating it all. Because if I didn’t unload this, it would have ended up being my breakfast for a week. With butter slathered all over it. Now you see why I had major temptation. SO good! Preheat oven to 350 degrees. Grease a standard loaf pan. Combine orange juice, eggs and butter in a small bowl and stir until thoroughly combined. Set aside. In a large bowl, mix together flour, sugar, baking powder and salt. Add orange zest and stir to combine. Add wet ingredients to dry ingredients and mix until just combined (do not overmix). Fold in walnuts and cranberries and transfer to loaf pan. Bake for about 50-55 minutes, until knife comes clean out of center. Cool in pan for 15 minutes, then place on wire rack to cool completely. This entry was posted in berries, bread, nuts. Bookmark the permalink. 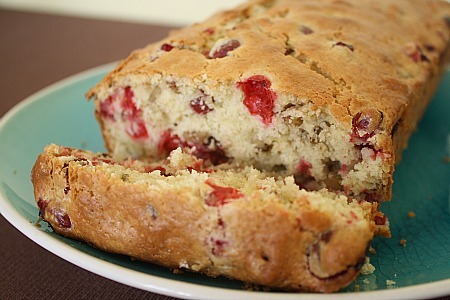 A fresh cranberry quickbread sounds so festive and delicious to me!